This is a true story from Taiwan. Chen Chuan-li, 75, has been raising cows since he was only eight years old. He knows the moods and habits of the animals well, can recite every phrase and proverb in Chinese having to do with them, and is the head-to-tail authority on everything bovine. In recent years, however, declining health forced Chen to part with almost all his cattle. One cow, however, was especially dear to his heart and he refused to let her go. When Chen suffered a stroke last year, he followed doctor’s orders religiously and went to the hospital regularly for rehabilitation exercises, all so that he could return to his beloved cow Ah Mei and tend to her. In spite of his efforts, however, Chen could not been regain enough of his former health to drive an ox cart safely. His family was concerned that he could fall down from the cart and injure himself. Thus just before the Lunar New Year, Chen made the painful decision to sell his cart and his cow for NT$150,000 (US$5,128). Chan says that if he were still in good health, he would not have sold the pair even for NT$200,000. He turned down an exchange offer of a Mercedes-Benz made by an elderly Japanese man two years ago. Ah Mei did not adjust well to her new family afterwards, however. For the first three days after she was sold, she would not eat at all, refusing to drink even water. In desperation, the new owner called on Chen to come over and reason with her. "Okay, you and I are splits now,” Chen told her. “You have a new owner, be a good cow now and eat your food!” Only then did Ah Mei begin to eat again. The new owner, surnamed Chien, understands the depth of Chen’s love for the cow. Chen would even blame him for using the wrong kind of grass for the cow, according to Chien. “He would say, with tears in his eyes, ‘That grass isn’t good enough for her!’” Chien recalls. 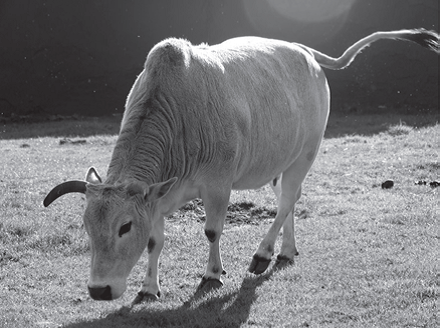 ​Unlike Ah Mei, cows in modern times are no longer considered to be sentient beings. They have been reduced to the status of mere meat bags, to be enjoyed as dinner or to be worn as suede suits.